May is an exciting month with many things to look forward to! May 6th-12th is Nurses Week - "National Nurses Week encourages organizations across the country to celebrate the dedication and outstanding contributions nurses make to health. Recognize and celebrate a special nurse in your life by using #NationalNursesWeek on social media!" (Source: National Day Calendar) Our team is beyond grateful for all of the nurses and medical staff who have been faithful in assisting with our heart screening events! May 7th-11th is Teacher Appreciation Week - "Teacher Appreciation Week honors those men and women who have dedicated their lives to educating the masses. Recognize and celebrate the teachers in your life by using #TeacherAppreciationWeek on social media or by visiting www.pta.org for ways to thank a teacher." (Source: National Day Calendar) We are grateful to all of the teachers who have been supportive of our cause and have taken great initiative in ensuring the best care for their students! Our final week of Spring 2018 screenings is rapidly approaching! We are looking forward to a very busy and successful screening week May 14-18 in Wakulla and Madison counties. Special thanks to our Madison County screening event sponsors, Buckeye Community Federal Credit Union and Timberland Ford of Perry, FL. Your contributions are greatly appreciated and we look forward to lives that will be impacted because of your generosity! Last but not least! - Welcome to our May Madness event! For the entire month of May, every $10 donation will be entered into a raffle drawing. 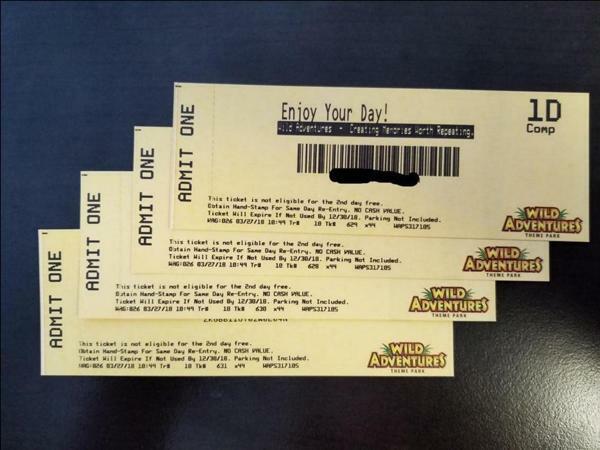 On Friday, June 1st, one lucky winner will be drawn to receive 4 one-day passes to Wild Adventures! Thank you to everyone who has faithfully supported our cause through prayer, finances, and time! We are forever grateful!